Kevin Hillstrom: MineThatData: Pay 'em! 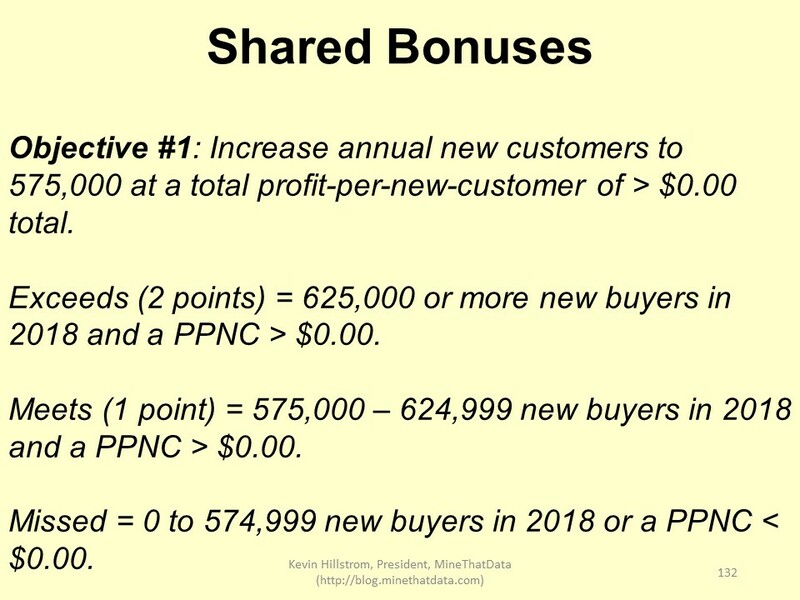 I finished presenting slides, including a series of slides outlining shared bonuses. Bonuses that are written identically for all salaried employees. A woman stops to see me, and offers a phrase I've heard often. "I love the idea of bonuses, but I'm never going to pay them to my staff. My team needs to be self-motivated." In other words, she didn't love the idea of bonuses. She loved the idea of people working together for the good of the organization, regardless of reward structure (or absent of rewards, to be more honest ... the employees should do 'what is right' while Executives and Vendors get paid). I worked with a company that had a good year, a really good year. Going into the next year, employees enjoyed paltry 2% "cost-of-living" increases. Vendors however, well, those folks got paid. The marketing budget grew by 15%, which meant that marketing vendors were getting 15% more pay. Paper / Printing / Postage / Email / Search / Social all "reaped the rewards" of company success. The person who managed those vendors earned 2% more pay. What in the name of Don Libey are we doing? In the past ten years, we decided to treat our own employees worse than the vendors that our employees hire. Please pay your employees. I simply don't understand why your vendors deserve to share in your success but your employees don't get to? Why do you prioritize your vendors over your co-workers? Seriously? I'd like to you to "join the conversation" and explain why employees are treated so poorly but vendors get to rake in coin?